In the Imaging tab, you can also conduct anisotropic RMO imaging (eta picking). At the tab header, click the Add icon and select New Episode to configure a new episode of RMO picking if you have yet to create a new episode to store your RMO Picks. Follow the steps in "Create episode" in Horizon-based RMO Picking. In the Imaging tab, select the episode which you want to create new RMO picks. Go to the Details Panel, click New RMO Picks. The Configure RMO Picking window will be displayed. Alternatively, click the Add icon in the Imaging tab, and select New RMO. Select the episode in which you want to pick the RMO and click Select. The Configure RMO Picking window will be displayed. 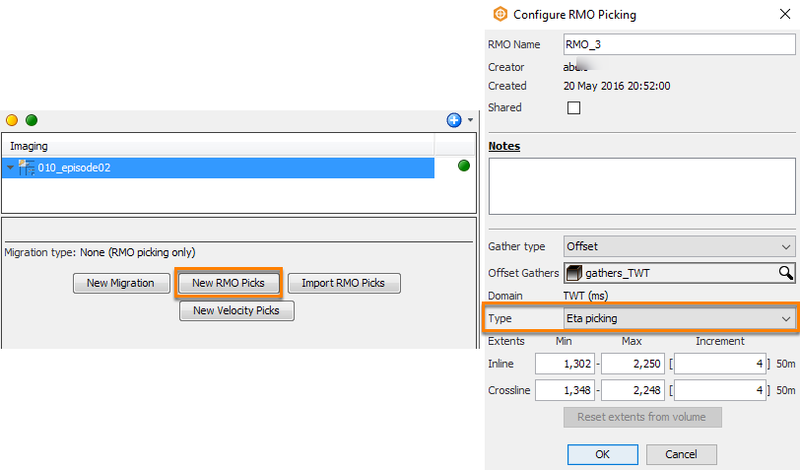 Select the gather volume to be used for the RMO picking at Offset Gathers. Both 2D and 3D gathers are supported in RMO picking. For 2D gather, only CMP gather can be selected for RMO picking. At Type, select Eta picking. Click to select the RMO item in the Imaging tree to open the Details Panel. At NMO Velocity, select your Normal Moveout velocity volume and type (see Normal Moveout Correction (NMO)). At Top Horizon and Base Horizon, select to use a Constant or Horizon, or both, to constrain the RMO picking. Leave these blank if you want to pick on the full volume. At Constrain to area, select a polygon/probe to constrain the picking within the polygon/probe area. Select the event type snapping option at Event type. Available options include Positive Event, Negative Event and Positive and Negative Events. The third option allows the propagator to pick on both the positive and negative events in one pass. Define the Minimum pick spacing on the surface. 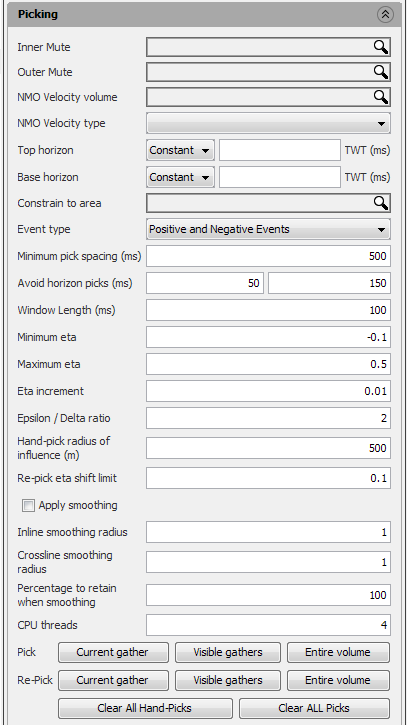 At Avoid horizon picks (ms), type the distance above (left box) and distance below (right box) for the picker to look for other horizon-based picks that had already been made in the episode and avoids picking in the vicinity of those horizons. By default, this is set at 50 ms (or 50 m) above and 150 ms (or 150 m) below. You can change the other picking parameters such as Window Length (ms), Minimum/Maximum eta and Eta increment if necessary. The Epsilon/Delta ratio is a conversion ratio used to calculate delta and epsilon from the eta. By default, this is set to 2. You can define the maximum allowed upward and downward eta shift when re-picking at Re-pick eta shift limit. At Pick, click Current gather to pick on the current location on the gather, Visible gathers for all visible gathers (if you are displaying multiple gathers in the Gather View), or Entire volume to pick on all the locations in the gather volume. During picking, a progress bar with the estimated processing time will be displayed.